Location: Gemaldegalerie Alte Meister Dresden. For the meaning of other masterpieces, see: Famous Paintings Analyzed. This work of religious art - a masterpiece of High Renaissance painting - by the Urbino master Raphael, was the last of his Madonnas and one of the last pictures he completed himself. Among the great examples of altarpiece art, it was commissioned by Pope Julius II and installed on the high altar of the Benedictine abbey church of San Sisto (St. Sixtus) in Piacenza. Originally, however, it was intended as a decoration for the sepulchre of Julius II, and the image of Pope Sixtus I (on the left of the picture) was selected because he was the patron saint of Julius' clan, the Della Rovere family. Reportedly donated by the San Sisto monks to King Augustus III of Saxony (1696-1763), it was moved to his capital Dresden in 1754. In 1855, it was installed in a room of its own in the city's New Royal Museum (Neues Konigliches Museum). In 1946, after World War II, it was moved to the Pushkin Museum of Fine Arts in Moscow, before being returned to Germany in 1955. Regarded by historians as one of the greatest religious paintings of the Italian Renaissance, it is currently housed in the Gemaldegalerie Alte Meister in Dresden. This divine piece of Renaissance art features a harmonious balanced design, practiced illusionism and church rhetoric. At the top, The Madonna is holding the Christ Child. Lower down to the left, Saint Sixtus humbly looks up to her while pointing outward to the faithful congregation with his right hand. In this act of mediation between the heavenly Madonna and the earthly plane of the viewer, he is joined by Saint Barbara standing opposite (whose relics were worshipped in the church of San Sisto), who inspects the scene with her downward gaze. At the foot of the picture, two picturesque winged cherubs are pictured resting on their elbows while gazing distractedly at the three figures above them. To the left, the Papal tiara of the former Pope Sixtus I rests on the frame of the painting, acting as a sort of bridge between the real and pictorial space. The three main figures - The Virgin, Saint Sixtus and Saint Barbara Madonna - inhabit an imaginary space, framed by heavy curtains which have been opened to reveal the heavenly scene. Positioned in the usual triangular arrangement, they are standing on a bed of clouds, looking down upon the church congregation which would be assembled below. Aside from the clever illusionism of the work, it exemplifies several other aspects of Raphael's unique skill as one of the finest High Renaissance artists. First, the layout of the figures is exceptionally balanced. Unified by gestures and poses, the trio enjoy a completely harmonious pictorial relationship, while happily occupying their own individual space. Second, the facial proportions of the Virgin, the Christ Child, Saint Barbara and the famous putti, are calculated to produce aesthetic looks: a feature which is enhanced by Raphael's skilful rendering of flesh tones and use of chiaroscuro. 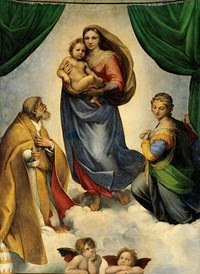 Third, notice the realistic perspective, or 'depth' which he creates in the painting, partly through the intrusion of the putti into the real space of the viewer, and partly through the triangular arrangement of the figures - both of which permits the Madonna to be positioned some distance into the picture, creating the illusion of depth in the picture plane. Fourth, see also Raphael's virtuoso depiction of the swirling drapery, which helps to direct the viewer's eye around the composition while enhancing the overall realistic nature of the scene. Fifth, Raphael's Renaissance colour palette also helps to direct the spectator's attention, and also adds warmth and richness to the composition. In all, a masterpiece of disegno. Compare this work with The Transfiguration (1518-20). Raphael was the artist who most resembled Phidias (c.490-430 BCE), the Athenian sculptor and artistic director of the construction of the Parthenon. The Greeks said that the latter invented nothing; rather, he carried every kind of art invented by his forerunners to such a pitch of perfection that he achieved pure and perfect harmony. Those words, "pure and perfect harmony" precisely express what Raphael brought to the Renaissance in Rome, as well as Florence and Urbino. His frescoes in the Raphael Rooms - such as the School of Athens (1509) - and his compositions on the traditional theme of the Virgin and Child seemed intensely novel to his contemporaries, and only time-honoured glory prevents us from now perceiving their originality. The sublime, which Michelangelo attained by his ardour and passion, Raphael attained by the sovereign balance of intelligence and sensibility. See also his portraiture, exemplified by Portrait of Baldassare Castiglione (1514-15) and his realistic Pope Leo X with Cardinals (1518).  For more about Renaissance painting, see our main index: Homepage.